What Does an Air Force Diagnostic Imaging Technician Do? Air Force diagnostic imaging techs provide critical technical expertise to the Air Force medical community by operating equipment such as x-rays, ultrasound, and magnetic resonance imaging (MRI) machines. The Air Force categorizes this job with Air Force Specialty Code (AFSC) 4R0X1. This work requires an intimate knowledge of human anatomy as much as it does an understanding of the technology, as they also help administer medical dyes, accurately target body structures for imaging, and in some cases even work with oncologists to deliver radiation therapy to cancer patients. Basic pay in the military is based on rank and time in service. Personnel can rank from E-1 through E-9 in the "enlisted" category that this job falls in. As of January 2018, the pay range for this category starts at about $19,660 per year for those in pay grade E-1 with two years or less of service. The salary caps at about $72,824 per year for those in pay grade E-9 with 20 or more years of service. Members of the military receive substantial compensation and benefits beyond their basic pay, including a housing allowance or receiving housing free of charge, as well as educational benefits and medical care at certain facilities. The Air Force requires those entering the diagnostic imaging field to have a high school diploma or GED and be at least 18 years old. Education: The Air Force requires applicants to have high school credit in algebra and either biology or general science, and further, recommends (but doesn't require) high school or college chemistry and physics coursework. No other special education is required to enlist as a diagnostic imaging technician—you'll get plenty of training once you ship to your formal school assignment. Testing: A score of at least 43 in the Air Force's general aptitude qualification area of the Armed Services Vocational Aptitude Battery (ASVAB) test is required. Training: Like other military healthcare careers, diagnostic imaging technicians begin their technical schooling at the massive joint-service Medical Education and Training Campus (METC) at Fort Sam Houston, Texas. Barring any delays, it takes nearly nine months to become a fully trained apprentice-level imaging technician. Training starts with about four months (19 weeks) of academic instruction at the METC covering basic theory of electricity, radiographic technique, film processing, digital imaging, anatomy and physiology, and theory of and special radiographic procedures and the associated equipment. Students are expected to maintain at least a 70 average, with 60 percent of their grade coming from written exams and the other 40 from practical application tests. Apprenticeship: Graduates of the academic phase move on to approximately six and a half months of clinical apprenticeship out in the real world, refining their knowledge and abilities in actual patient care settings throughout the Air Force. Specialization: Later on, working Air Force imaging techs may have the opportunity to return to the METC and specialize in nuclear medicine or diagnostic ultrasound. They may also specialize in the use of magnetic resonance imaging (MRI) through locally approved courses. Comfort with technology: Operating and inspect medical technology is a major part of the job of a diagnostic imaging tech. Ability and willingness to bear arms: All Air Force personnel are required to be able to bear arms in defense of the U.S. Those who have a sincere objection to participation in war or to bearing arms may not meet the requirement. Physical fitness: All members of the Air Force must meet and maintain fitness requirements, even if their positions don't require combat. Mental preparedness: Members of the Air Force must be mentally fit and able to handle working in stressful situations if needed. According to the U.S. Bureau of Labor Statistics, job opportunities should be "very good" through 2026 for all branches of the Armed Forces, including the Air Force. 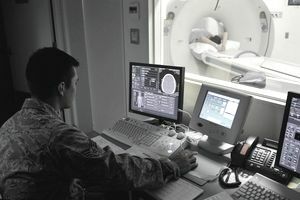 During a career in the Air Force, diagnostic imaging techs may be assigned throughout the country at a variety of stations as well as overseas. Air Force, diagnostic imaging techs typically work full time, but exact hours vary based on location and need.